Wander through the new Northeast Cargo Facility at Chicago O’Hare Airport (ORD), and you never know what you’ll see. It could be a multimillion-dollar racehorse, a 1950s Ferrari restored to impeccable condition, or something so unique it’s hard to tell exactly what it is. In 2015, when overall U.S. foreign trade declined 5.6%, business was booming in Laredo, TX. In fact, trade was at a record high, and Laredo climbed to third in the nation-behind only Los Angeles and New York City. In June 2015, Seattle-Tacoma International Airport (SEA) completed a $23 million cargo expansion project designed to support the growing cargo demand the airport is experiencing and hopes to increase. Cargo is already a dominant force at John C. Munro Hamilton International Airport (YHM), and it's about to get even bigger, and more diverse, with the opening of a $12 million warehouse complex. Chicago O'Hare International Airport (ORD) continues to progress toward its goal of becoming the North American leader in global air cargo with the recent opening of a $35 million landside warehouse and more airside development in the works. As in real estate, "location, location, location" can be crucial for airports. It's especially true for Ted Stevens Anchorage International (ANC) in Alaska. The state-owned airport has parlayed its geographic quirk into a competitive advantage. With three runways (all longer than 10,600 feet), special ramp facilities and procedures, and a little help from the federal government, ANC has molded itself into a critical refueling stop for cargo carriers flying the skies between Asia and North America. While most airports are more than just airplanes and runways, Ohio's Rickenbacker International Airport (LCK) stretches the usual format further than most. In addition to cargo, military and passenger services, it also includes rail and trucking. As such, the airport is a key component of the Rickenbacker Inland Port - one of the largest integrated logistics complexes in the United States. Riding a province-wide economic boom, Alberta's Edmonton International Airport (YEG) is leveraging $30 million of cargo area improvements to attract larger aircraft and expedite freight transfers for a variety of shippers. Ohio's Rickenbacker International Airport (LCK) stretches the usual format further than most. In addition to cargo, military and passenger services, it also includes rail and trucking. As such, the airport is a key component of the Rickenbacker Inland Port - one of the largest integrated logistics complexes in the United States. More than a decade ago, FedEx announced it would locate its mid-Atlantic hub at Piedmont Triad International Airport (GSO), in Greensboro, NC. And ever since, the airport and region have worked to prepare for the carrier's arrival. A downturn in traffic has delayed Tampa International Airport's $2 billion North Terminal project from 2015 to 2025, but it didn't slow construction of a nearly $17 million facility for cargo and ground support equipment (GSE). Given its location, George Bush Intercontinental in Houston should be an attractive airport for cargo companies flying goods to and from Latin America. Until recently, though, it didn't have the infrastructure or logistics partners to accommodate the volume of perishable goods such companies typically ship. 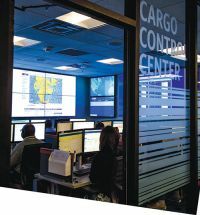 The Port of Huntsville in Alabama opened its new, 92,000-square-foot air cargo building in May, achieving a milestone toward its mission to provide quality intermodal transportation services to a diverse customer base and expand the economy of the Tennessee Valley region. Chicago Rockford International (RFD) is currently the 18th busiest air cargo airport in the United States in terms of landed weight, but it doesn't plan on holding that position for long. With Phase 1 of a new International Cargo Complex recently complete, it's poised to climb much farther up the list. Speed, reliability and global reach are hallmarks of FedEx service, all of which require ample resources. When forecasts signaled long-term package volume growth - particularly for international shipments - the corporation called on a key airport hub for additional capacity.